Doctor’s Choice™ Men / 90 tabs - Nature's Way®. Why are multivitamin and mineral supplements important? Nutrients from diet alone may be insufficient. Many Americans have nutritional gaps in their diets - even when they try to eat a healthy diet. Multivitamins can help fill those gaps. 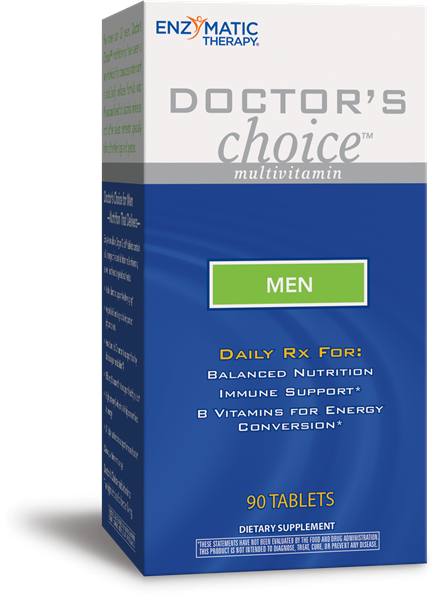 Why take Doctor's Choice™ Men? Targeted to your age and gender. Take 3 tablets daily with water. Best if taken with food. How much caffeine does Doctor's Choice Men contain? Doctor's Choice Men contains a minute amount of caffeine, derived from the green tea leaf extract. The total daily amount of caffeine is only 1 milligram. For comparison, the average amount of caffeine in one cup of coffee ranges between 80 to 115 milligrams, depending on the method of brewing and type of coffee bean used. I have trouble swallowing big vitamin tablets. Why are your tablets so large? This is the most frequent question our customers ask. While the tablets are large this is necessary in order to include the optimal amounts of nutrients for good health. They have a coating which gets slippery when in contact with water or saliva to help make them easier to swallow. A suggestion to help swallow tablets is to first take a sip of water to moisten your throat. Then place the pill on the tip of your tongue and take a small sip of water. But instead of tilting your head backwards (as many of us are tempted to do), tilt your chin down toward your chest. This will cause the tablet to float towards the back of your mouth, making gravity do most of the work. And if you tend to gag when taking your pills, take a deep breath before putting the tablet in your mouth. This helps suppress your gag reflex and makes swallowing much less uncomfortable. Why do I have to take so many tablets of the Doctor’s Choice ™ multivitamins each day? Can’t I get all the vitamins and minerals I need from one tablet? In order to obtain the optimal amount of vitamins, minerals, and herbs to be effective, they need to be in amounts that could not possibly fit into a single tablet or capsule in a size small enough to be swallowed. Many nutrients are only active in the body for a short period of time and need to be replenished every 6 to 8 hours. Our Doctor’s Choice™ multivitamins are designed to be taken at intervals during the day (3 times a day, just like meals). You can take fewer tablets than we recommend on the label, however, it if is difficult to take them throughout the day. Even at half the recommended dosage there is still significant nutritional support. Why do I get an upset stomach when I take my Doctor’s Choice™ multivitamins? It seems to happen most often when I take them on an empty stomach. Reduce the number of tablets from the recommended four or six each day to just two or three daily. Take your multivitamins later in the day; take two with your evening meal and two at bedtime with a small snack. Take your vitamins with a clear carbonated beverage, such as ginger ale or lemon/lime soda. If none of these help, stop taking the Doctor’s Choice™ Multivitamins for a few days to rule out underlying problems. Your nausea may have coincidentally occurred when you started taking the vitamins but may actually be unrelated. Contact your doctor or other healthcare practitioner if your nausea is still present. Not intended for use by pregnant or nursing women. If you have a blood clotting disorder, are taking medications for diabetes, or any other medications, consult a healthcare professional before use. People with diabetes should monitor blood glucose levels regularly.